Perfect as the nights close in and the seasons change. This is our second recipe from Rick Stein’s Spain and another success. It takes two days to make but is so straightforward that it’s not a chore at all. As we had torrential rain in Dublin on Saturday and Sunday we could not have picked a better weekend to try it! P.S. you have to like sucking on bones! Trim the excess fat off your oxtail pieces and season well with salt and pepper. Toss in the seasoned flour and knock off the excess, keep the remaining seasoned flour. Heat 2 tbsp of olive oil in a large flameproof casserole over a medium-high heat, add the oxtail pieces in batches and fry until well browned. Lift them onto a plate as they are done. Add the rest of the oil to the pan with the garlic, onions, carrots and leeks and fry for about 10 minutes or until browned. Pour the brandy over and set alight. Once the flames have died stir in the remaining seasoned flour, then gradually stir in the red wine and bring to the boil, stirring. Simmer for 3 minutes, then stir in the oxtail, the beef stock, bouquet garni, 1/2 tsp of salt and lots of black pepper. 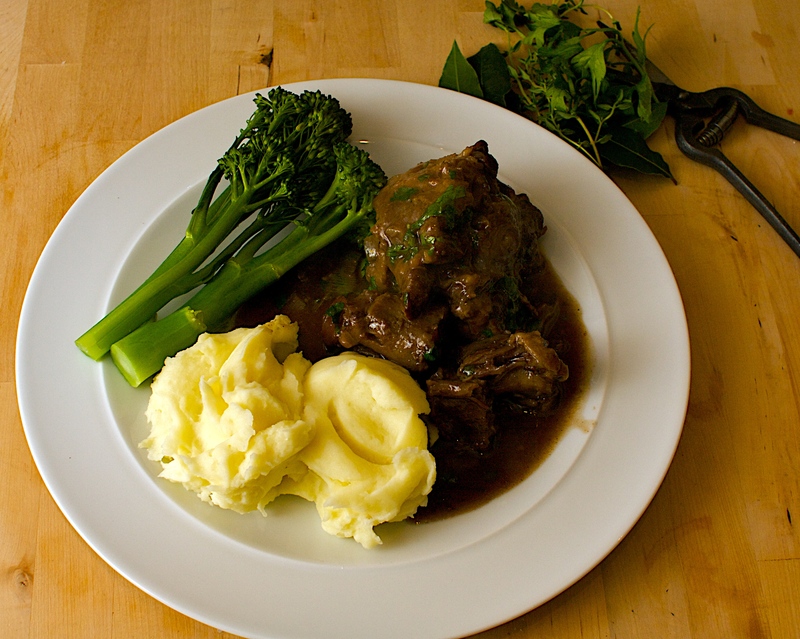 Cover and simmer gently for 2 1/2 – 3 hours, until the oxtail is tender but not falling apart yet. Remove from the heat, leave to cool, then cover and chilli overnight. The next day, scrape the layer of fat off the top of the casserole. Gently reheat, then lift the oxtail into a bowl. Pass the sauce through a fine seive into a clean pan, pressing out as much sauce as you can with the back of a ladle. Discard what’s left in the sieve. Return to the heat and simmer vigorously for 5-10 minutes until the sauce is reduced and is well flavoured. Return the oxtail, season and simmer for 5 minutes to heat through. Serve sprinkled with chopped parsley. Nice with steamed or mashed potatoes and broccoli. Wine Suggestion: Pick a medium bodied red wine based on Tempranillo and maybe with a dollop of Garnacha to give it extra juiciness. We drank a Sierra Cantabria Cuvée which had some good age in the bottle and 18 months in oak which softens and rounds the tannins. Anything heavier or more tannic will feel a bit too much with this rich dish. I’m hungry! Wish I was having this instead of pizza today. So glad you posted this recipe, it doesn’t show up on the Rick Stein in Spain web pages! It looked so dark and rich on tv that I have wanted to cook it for ages. Oxtails are ordered, one to practice this weekend and two next week when I will prepare it for my butcher and his partner!